DST's Dr Christine Shanahan has been recognised for her outstanding contribution to Defence in the inaugural 'ADM Women in Defence' awards. 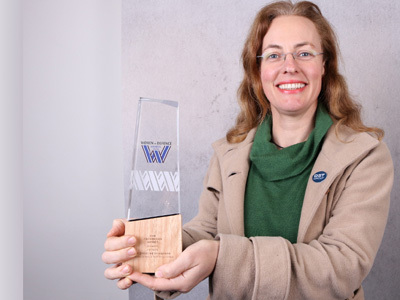 Dr Shanahan received the 'Women in Defence Award for Engineering' for her consistent delivery of engineering expertise and problem-solving to Defence, which has resulted in both monetary savings and the enhanced protection of soldiers. The awards were announced at a gala lunch in Canberra, attended by up to 250 guests, including the patron of the awards, Minister for Defence, Marise Payne. Established by Australian Defence Magazine (ADM), the awards recognise people in the defence community, both in uniform and in industry, who provide critical support to the ADF. In launching the awards, ADM editor Katherine Zeising stressed the importance of recognising people and their contributions. "All too often we hear about the problems and not enough about what is going well, about what is working. We're looking to highlight the successes of this community both through the established Essington Lewis awards program and now through Women in Defence Awards," she said. Dr Shanahan, a Mechanical and Space Engineer, has worked at DST for 13 years. In that time, she has undertaken research in a range of areas, but it was her work in two key areas that earned her this latest distinction: her research into the service life of missile ordnance and the aging of propellants, which resulted in significant monetary savings for Defence; and her investigations into the effect of improvised explosive devices on buildings and people, the results of which have contributed to Australian Army Force Protection design documents and prompted upgrades to a number of ADF bases.